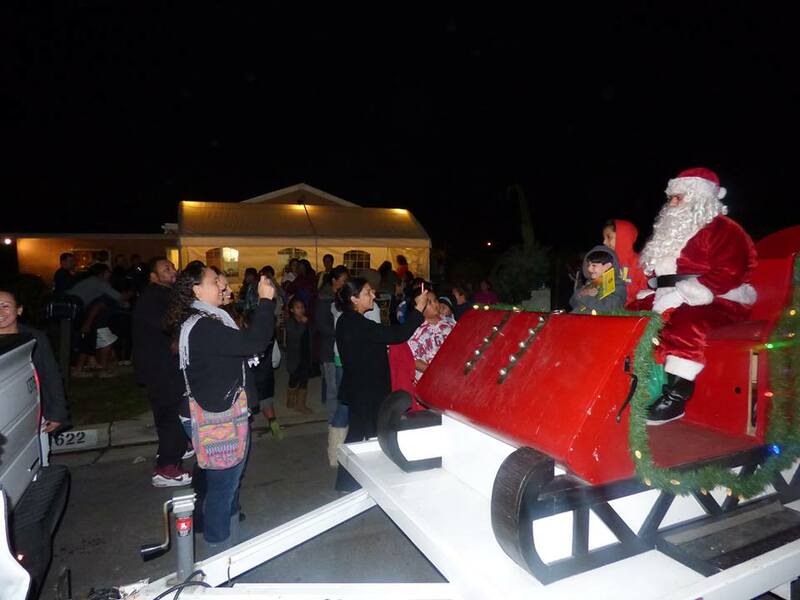 Since 1980, Arieta F. (Teta) and Tuala Falea'ana Meni, a Samoan family have arranged for Santa and his sleigh to park in front of their house in Carson, Calfornia for an hour while nearby kids and parents take Christmas pictures. This visit welcomed the Christmas spirit in the neighborhood by allowing everybody to enter their home to eat and take pictures with Santa Claus. 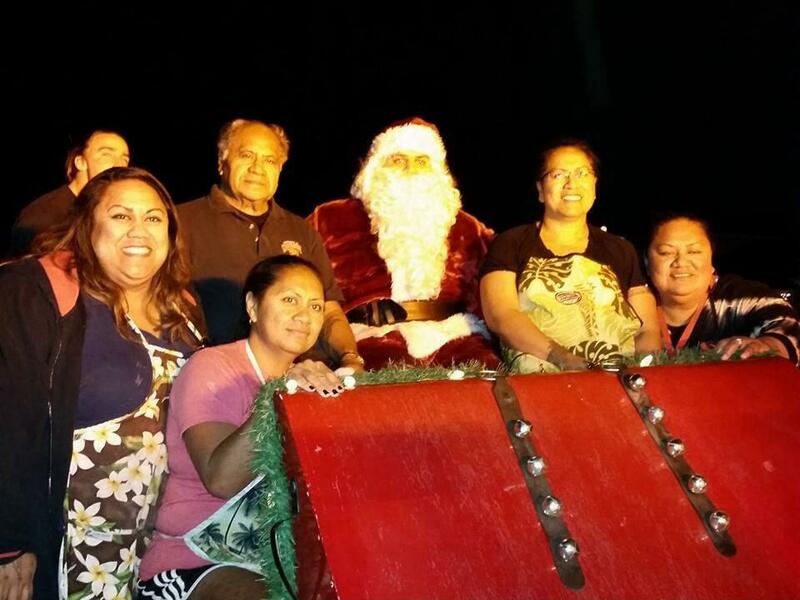 Like any typical Samoan family who worry less about privacy, intruders or thieves, they welcomed everybody into their home and the community has become well acquainted with this special opportunity to share Santa his sleigh and the good food the Meni family puts out for everyone. Always quite a night for children as well as grown up people, they all enjoyed posing with Santa Claus on his sleigh right there in the street. The white tent and chairs prepared in front of the garage are for anyone to sit down and enjoy a warm dinner. 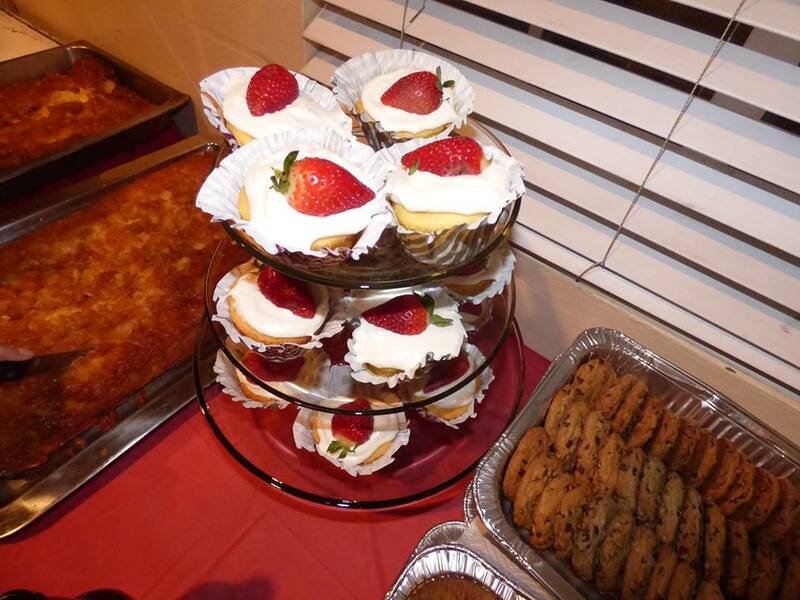 The young ones enjoyed the home made sweets more than anything else until Santa and his sleigh arrived at 8:30pm. Its always a very heart warming experience to hear the family reminisce about their mother Arieta who started all this back in the 1980s. She passed away several years ago and the family is keeping Santa and his sleigh as a family affair and something they dedicate to her memory. Papa Meni enjoyed helping his family do the cooking. He would fry the chicken with tongs then open his beer with the same tong. Thats a unique skill only Papa Meni can do. 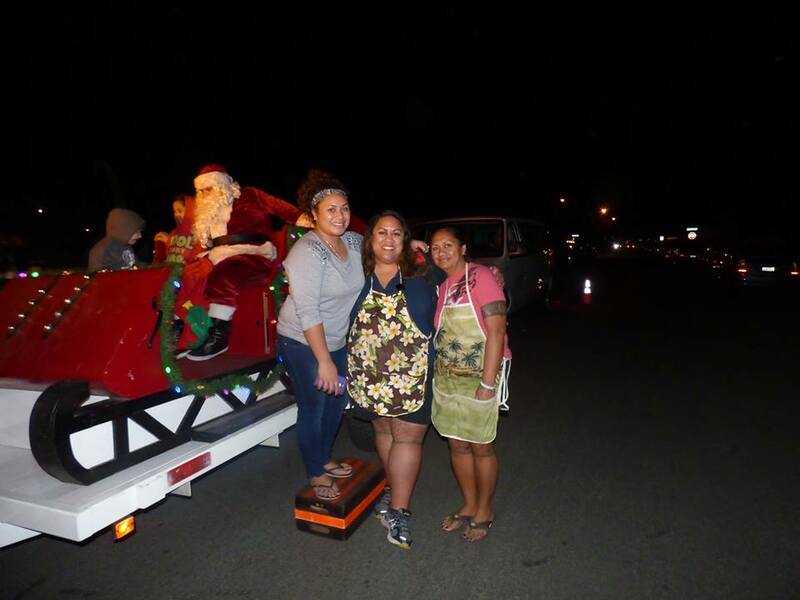 The daughters Arieta, Seiuli To, Lagi and Silafaga appreciate their fathers help and are happy they can do such a family oriented event that all their neighbors and community can enjoy. 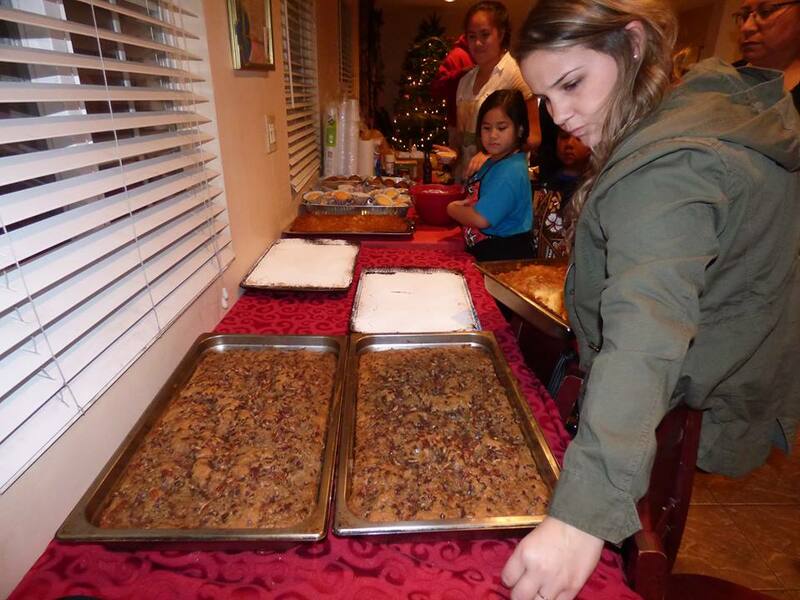 They now have laid the foundation for this tradition to be continued into the next generation as they show their young girls how to mix the dough and cook the delicious food and bake cakes and treats in the oven. Its turning into a community event as the friends especially the young ones are more than willing to help out and support this event. 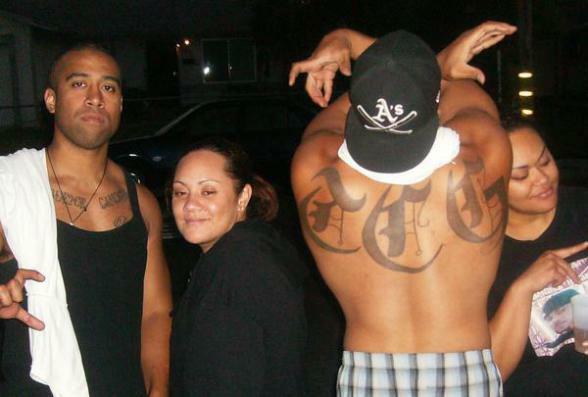 Samoan and Tongan street gangs have clashed in southwest Los Angeles County for decades; but a pair of recent shootings has brought the violence into sharp focus for the larger Pacific Islander community. Nearly 250 people, including Tongans and Samoans, joined local law enforcement officials at a Carson Community Center town hall meeting Wednesday night, to vent their frustration over gangs and to brainstorm ways to defuse tensions between their young members. Tongan and Samoan leaders started meeting with police after a Sept. 24 shooting outside a Long Beach home injured a Samoan pastor, his wife and another church leader. That attack came days after a Tongan man was fatally shot in Hawthorne. 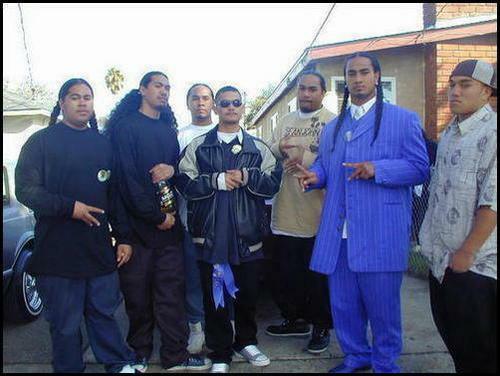 Police have yet to solve either case, but that hasn’t stopped gang members and non-gang members alike from linking the two, and talking on Facebook and Instagram about an all-out war between Samoan and Tongan gangs. 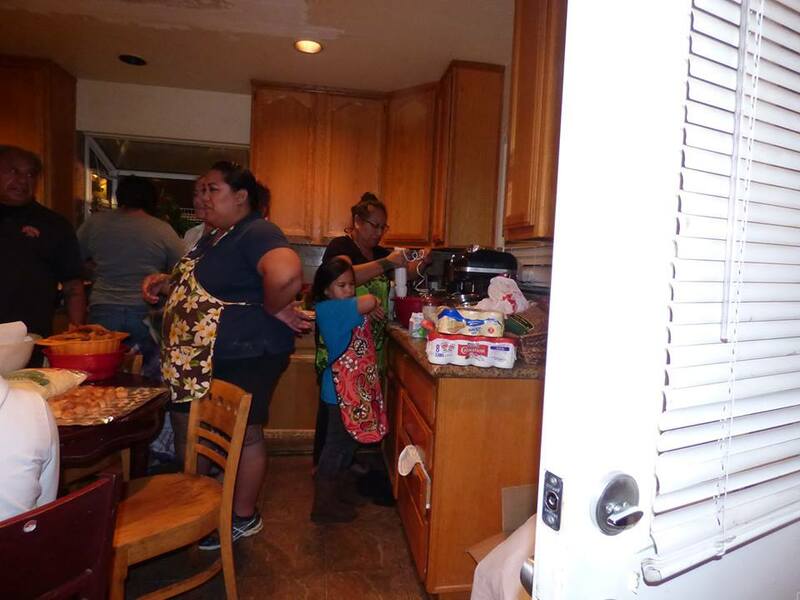 June Pouesi of the non-profit social service group Office of Samoan Affairs in Carson, said she saw rumors flying fast and loose on social media. Ma'umalanga said that online commenters were trying to link rivalries between Samoans and Tongans many generations ago to the present-day. Gang tensions upset LA’s Pacific Islander community"It comes down to ignorance of them trying to tie gang issues to tribal issues centuries ago," Ma'umalanga said. At the Wednesday meeting, attendees broke out for brainstorming sessions on how to better engage young Pacific Islanders being drawn into gang life. Ideas ranged from inviting young people from both communities to barbeques and sporting events to getting clergy more involved in quelling gang activity. 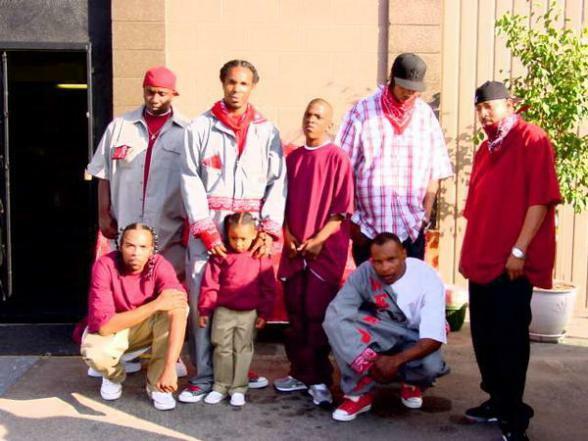 "Within our congregations, we got to take those blinders off and realize we have gang members in our churches," said faith leader Lauolefiso Ali'ifua. Afterward, Gautt told KPCC that police wanted to discourage people from taking retaliatory measures. “Certainly we don’t want anybody to run out on a myth and believing they’re protecting themselves and cause harm to another human being or family,” Gautt said. 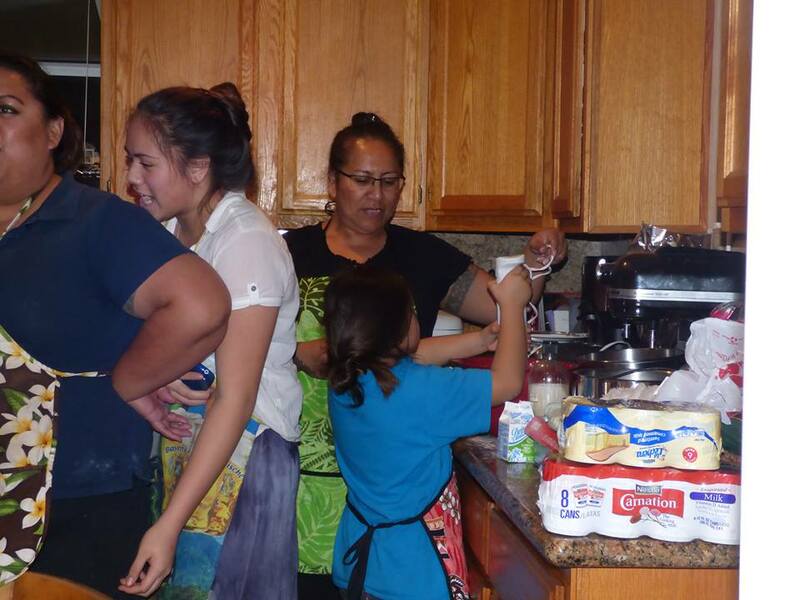 Sixteen-year-old Samoan-American Benjamin Seiuli of Carson said he was bothered by the conflicts between Samoan and Tongan gang members because "we're all one people." 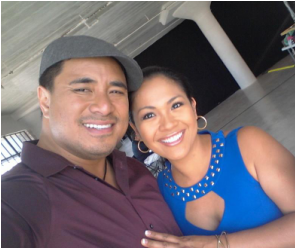 Intermarriage is common between the two communities, and Seiuli said a half-sister of his is part Tongan. "Samoans and Tongans — we're actually cool," Seiuli said. "The gangs itself are what's causing the big problem out here and it's putting everybody in danger." Bringing together distressed Home owners and Mortgage lenders July 22, 2014 in the inland empire. Please take advantage of this chance to save your home. Faasilasila atu i le mamalu o le lautele o loo fia maua le fesoasoani i latou fale i le itu o le Inland Empire, Riverside, San Bernardino, Los Angeles County, Orange County, San Diego. Afai o faafaigata ona gafatia le mokesi o le tou fale, ona tala mai lea o aao ma susu mai i le tuatusi lea e i lalo ifo ina ia mafai ona matou faavasega ina le tulaga o lo'o i ai le peimene o lou fanua poo lou maota. O le polokalame lenei e sau mai le polokalamae a Obama ina ia fesoasoani i e o lo'o aafia i le faaitiitia o le tupe sau i totonu o le pakeki ae ua tele pili. O lo'u itula fesoasoani i lenei aso e amata au i le 9am, (taeao e oo atu i le 1p.m. i le afiafi. Making Home Affordable Program, are partnering with the HOPE NOW Alliance and Neighbor Works America® to bring a free homeowner event to Riverside. These events are designed to help bring together homeowners in financial distress for a face-to-face meeting with a representative from their mortgage lender and/or local housing counselor. I am scheduled to volunteer in assisting this event from 9am to 1pm. Come see me and my team if you need answers to questions you may have regarding your distress home. 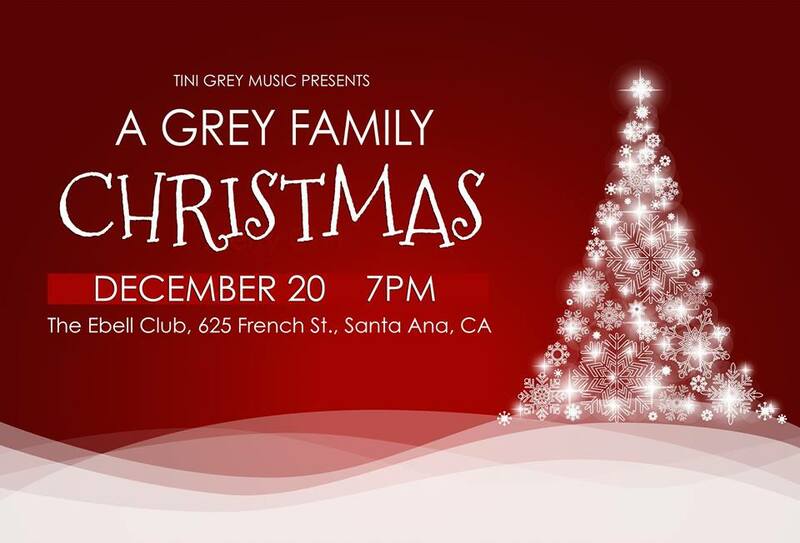 Jerome Grey and family, host an Island Style Christmas Concert in Orange County, CA set for Dec. 20, 2014. THE PLACE TO BE....Las Vegas USA Sevens Tournament 2014. And it was one big party as usual. Photos by Mile Stanley. Posing for the camera were some of our LA Rugby fans who were in Las Vegas for the Sevens Rugby Tournament. The USA Sevens in Las Vegas was the place to see and be seen for our SoCal Samoan community, many of who made the 4 hour trip to Las Vegas and were treated to a number of concerts, festivities, gambling and of course the USA Sevens Rugby Tournament. This year's tournament held everyone's attention as Samoa won its first four games and entered the final day of competition with a good chance to take it all. How ever that was not to be as the South Africans who eventually beat the All Blacks for the Cup, were very determined and against a young team with all new caps, the boys from Samoa ran out of luck and steam. Samoa came in 4th overall for the tournament but have increased their standings in the World ranks from this showing so in the big picture they were actually quite successful. Speaking to the coach of the Manu Samoa, Viliamu Punivalu, he made it clear to us that this team is new. This is only their 2nd tournament so he wanted the Samoan fans to be patient and not lose faith. "They are a young team and they need more experience." was Punivalu's evaluation of the team. But as we watched them perform and come back numerous times to win, it was obvious they had the heart and the skill. All they really did need, as was pointed out by Coach Punivalu, was experience. The fans, although down from the close finish, were still up beat and supportive as was seen when the team was honored at the Aiava held in their honor at the Circus Circus Hotel, which was put together by Mr. Tapeni and the Samoa Affairs of Las Vegas organization. The event hosted the team who were all there with their coaches and other team officials. 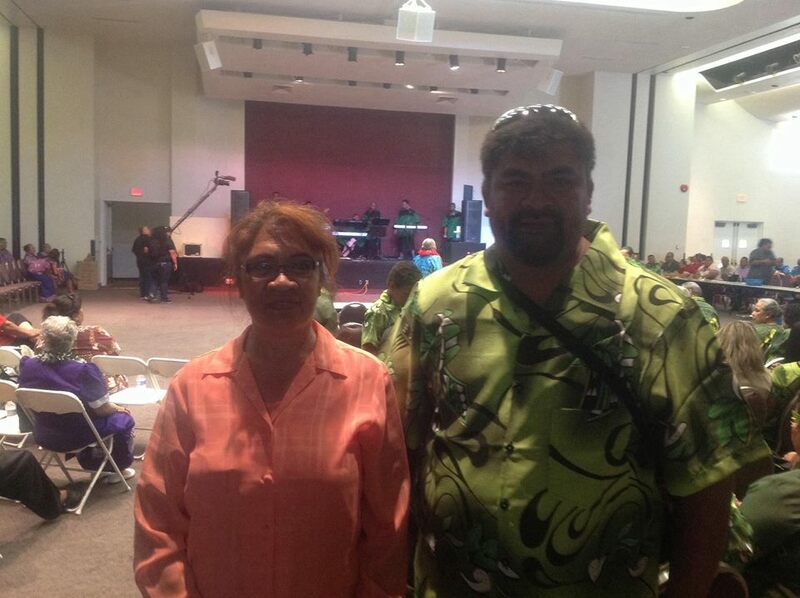 The boys were each invited to dance and the over 500 attending Samoans from Utah to California all contributed money. At the end of the evening the Samoan Affairs of Las Vegas presented the team with an amount exceeding $US5000 as a going away present. This was well appreciated by the team who have been financially strapped due to difficulties in the Samoa Rugby Union's management of resources for the team. These monies will be distributed directly to the players and coaches. In many instances family members gave money directly to the player they chose which was a way of making sure the boys were able to secure some kind of reward for playing so hard to take our Samoan team up into such high rankings against teams with unlimited resources like Britain, New Zealand, Australia, and South Africa. There are various efforts being implemented now by different organizations including Siva Afi Designs in Samoa, and Le Malae, to raise money for these players and their coaching staff so we can secure these good players and personnel for future tournaments. More information on these efforts will be presented in our Network as we make this happen. The USA Sevens Rugby Tournament 2014 was a great success and we congratulate them for putting together such a well run event for the fans of Sevens Rugby in the USA. We were happy to see NBC broadcast direct from the Stadium to the American public the final games of the tournament. It should be promoted as an alternative to football much like soccer has taken hold in the American Culture so should Rugby Sevens be accepted and promoted for young Americans to enjoy what we already know is a very exciting brand of Rugby, the Sevens. Til next year, Go da Manu!! For more photos from the USA Sevens go to the Photo Gallery. A Samoan Young Man graduated as a Dentist from USC. Dr. Taupa'u Fiaui Siona Motufau partied his heart out with the Samoan Rialto Ward celebrating his accomplishment of his Doctorate Degree as a Dentist from University of Southern California yesterday Saturday 17, 2014 at Rialto Stake Ward, Rialto. He is one of the few Samoans who is an overachiever and took education seriously without giving up. Dr. Taupa'u Siona Mulipola, in his speech and also while tearing, gave credits to a wonderful wife Stephanie for all the supports she provided throughout the years of his studies. They shared his dream together to become a dentist and they worked at it. Yesterday, they celebrated it with his families and friends in Rialto, California. It was a nice proud crowd who joined the Motufaus to celebrate this dreamt day. The Motufaus prepared a huge feast consisted of the Samoan muscle builders, as well as love handle builders such as Taros porks, corned beefs, chickens, colorful oka i'a with cucumbers, tomatoes and onions, also served with their special Vai Mago or mango twist, and closed it with the cake as a desert. Dr. Taupa'u Mulipola was born in Compton, California, in the midst of the low income and the rough and tuff in Los Angeles. He grew up amongst the gang bangers, drugs, and violent with his seven brothers and four sisters. His parents then decided to move to Rialto to get away from the rough area so they could give Siona (his childhood name) and the rest of the siblings a second chance to finish school without the interruption of the influence surrounding them. He is a son of Mulipola Siona from the village of Manono, and Tuvaetasi Fiaui from Lefaga, Samoa who passed away several years ago. His father remarried to a wonderful stepmother Laumua who also contributed in providing supports. Before the party, Dr. Taupa'u approached me while prepping utensils for food with a huge smile as a proud man who did it, gave me a hug and of course I had to shake his hand congratulating him for not giving up. I watched him grew up when he was a baby until he went to school and now. As I was shaking his hands I think back on the day when I first bought my house, his father Siona Mulipola made him and the brothers helped me moved. They used to wrestle each other and didn't matter what they were doing and where they were at.... so that day, one of the wrestlers came with a bleeding head. I asked them "What happened?" And they said they were wrestling and Siona (his childhood name) banged his head onto one of the boulders in front of my house". After they were done moving and gone I noticed the head of my unicorn figurine that I bought from one cancer lady whom I worked with at Chicago Title came off. They must have rolled on it too while wrestling. Dr. Motufau played linebacker for Fontana High school. He wanted to be another Junior Seau and he was famous amongst the schools for such a good player. Then his family talked him into getting a contractor license so they could utilize the family talent and he did. The "USO Contracting Company". Siona put all the brothers to work and he ran the business. However, his heart was to finish school. So Siona went back to college and achieved Doctorate as a Dentist. There's not many Samoans in the Dentist field. 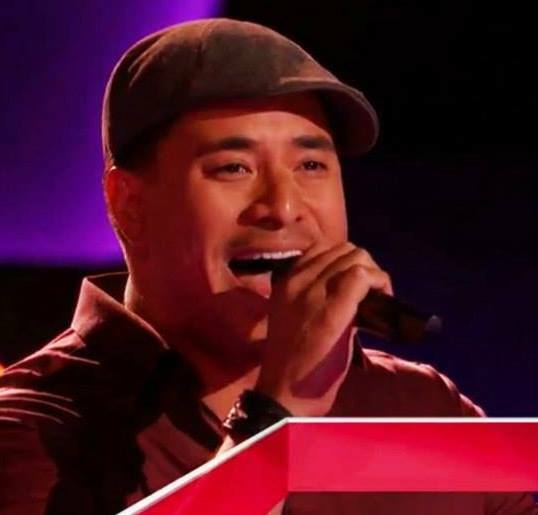 Anyway the examples he set for the youth, mainly the young Samoans in the Rialto, San Bernardino area and his families is hugely impacting morales, determinations and is also greatly appreciated by every Samoan parents. "Yes You Can Do It" attitude despite his brokenness from being a college student alone. 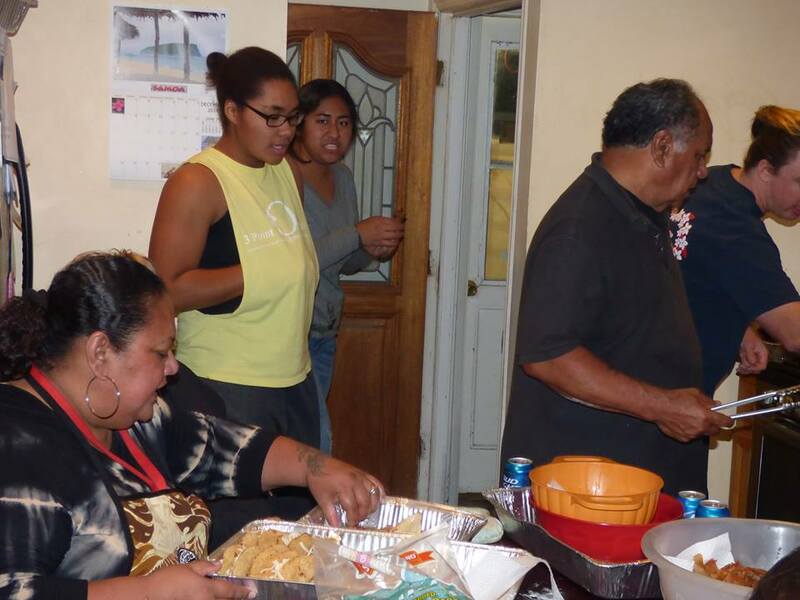 Like Bishop Percell commented at the party as he spoke at the celebration, "This is the reason why the Samoan parents move to the US is to provide a chance for their children for better educations". Dr. Taupa'u Mulipola is looking to open an office soon in either Los Angeles or San Bernardino. He might do both. Though he has a few in his agenda, but for now he is just celebrating a job well done. And already one of the church member speaker urged him to lower his Dentist charges. From my opinion, Dr. Motufau might just work for free for his huge family members cause he is a kindhearted guy. After a week of religious and ecumenical discussions and instruction the EFKAS Conference ended with a flourish of color and dancing. 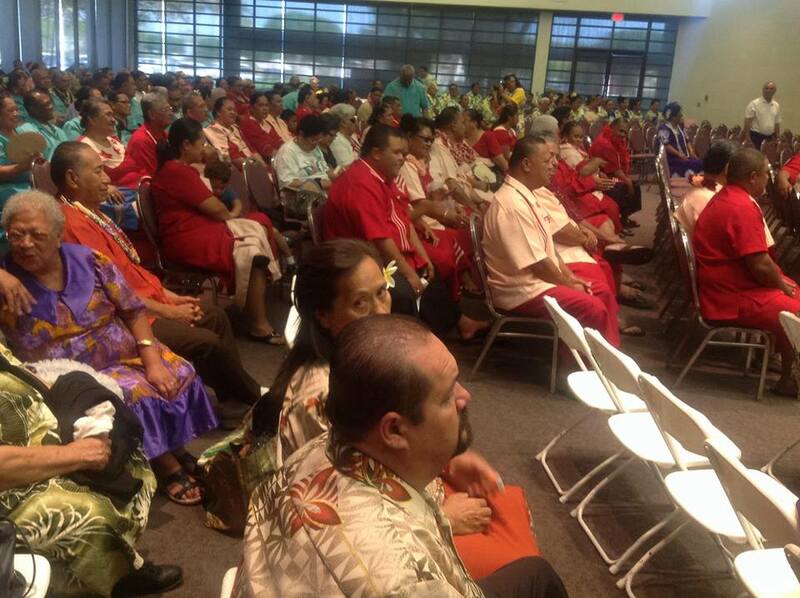 The conclusion of the week long EFKAS Conference held for the first time outside of American Samoa was a colorful combination of Samoan puletasi and Aloha Shirts that all in attendance were required to wear and it was the climax of this Samoan religious event. The delegates from different EFKAS church congregations around the world gathered in Carson, California at the Carson Convention center and held a fiafia with a simple but appropriate theme. Lavalava Teuteu Fa'aSamoa is the Title of one of the old song that was apparent and transpired last night at the Convention Centre in Carson Civic Center, not by wearing and danced in the actual kuiga, titi fulumoa, and a short attire by a taupou, but simply wearing an "As Is" puletasi that translated the spirit of the evening. Their generous monetary gifting by each Pulega (district) participated in this convention also translated the nature of tagata Samoa.Their kind hearted, and again generosity .... will give their shirts off their back when needed or give their last meal for a good cause. They collected more than $116,000.00 American dollars last night August 1, 2014 for the development and building of the church and other affairs in America or America Samoa. EFKAS was started from Malua, a home of all the Pastors of the EFKS, Ekalesia Faalapotopotoga a Samoa aka Congregational Christian Church of Samoa in Upolu. It was carefully developed by papalagi (white man) who lead by John William back in the days. When the palagi realized that their goal and everyone of the Island of Samoa changed their ways to be Christian, they asked them to co-mingle the fa'asamoa (Samoan culture) in the church and owned it. Last night was beautiful and colorful as shown in the pictures. Enjoy and see if you know anybody there! The Future may use money that we get online and not from a Bank. Good idea? New money that is sweeping the internet. Its not a dollar or yen or pound...its Bitcoin. When I was searching for a house in the State of Las Vegas for our Lemalaes team, I came across couple of houses accepting Bitcoins. I asked myself, Really? Bitcoins? However, lately Bitcoins came across my investor’s emails more and more. So then I researched how many people other than these investors actually use Bitcoins as a trading method. Who’s behind Bitcoin? And what are the pros and cons of Bitcoin? First of all, Wikipedia noted “Bitcoin was introduced as open source software in 2009 by pseudonymous developer Satoshi Nakamoto.” Who is Satoshi Nakamoto? Some said he is a Japanese mathematician who magically appeared in 2008 and then disappeared. Also Bitcoin is an innovative payment network and a new kind of money. Bitcoin uses peer-to-peer (in other words person to person) technology to operate with no central authority or banks; managing transactions and the issuing of bitcoins is carried out collectively by the network. It sounds like a good idea, but what else we don’t know about Bitcoin trading. Bitcoin is an open-source; its design is public. Nobody owns or controls Bitcoin and everyone can take part. Bitcoin is supposed to be a worldwide exchange. It’s also supposed to be zero or low processing fees. How is this new method going to affect Samoan people in general? It supposed to cut excessive interest rates, bank charges, overdraft charges but as time goes on we will follow the leaders. Well I am definitely not trying to sell Bitcoins, but giving you a heads up if you’re not already know. Michael A. Robinson, a Strategic Tech Inventor, sent me an email yesterday about “The Rise of Bitcoin” He followed this story and reported that “In October, 2013 President Obama summoned the head of Google Eric Schmidt to the Oval Office and asked him face to face if Bitcoins was "something he has to worry about." China is reporting abandoning both their gold and U.S. dollars for Bitcoins. The first machine opened for business in October 29, 2013 in a coffee shop in Vancouver, Canada. Also “Three New Hampshire residents are working on making Bitcoin ATMs for a venture called Lamassu Inc”. Designed in Portugal and costing as much as $5,000, about 40 of the machines have been ordered from customers from as far away as Australia, Denmark and Brazil, CEO Zach Harvey said. Anthony Gallippi, a CEO and founder of the BitPay, (almost like paypal) said in the Senate meeting November 19, 2013, this will create job opportunity in America. The hype of Banks and their credit cards are going to fade away and the criminals will come up with a way to outsmart the system is a known subject related to Bitcoins. Pastor SUNY and some of her congregation including Lucia's parents and Lucia after Church in Maywood. February is American Heart Month. For that reason, Pastor Suny Lee and her congregation of the Methodist Church in Maywood wear red each Sunday for the month of February. Lucia Brown, one of the young members, was born with heart problems. Her first heart surgery at three-months old was very scary for her entire family, as well as her church family. Her grandmother Simau Tuiali’i reports that she had a second successful heart surgery at six months old. Lucia is now two years old, and is an active and pretty girl with such a bright smile. If you see her, you would not believe that she has had heart complications and two surgeries that saved her life. Her mom Melissa Brown has a hard time keeping up with her now as she runs and jumps around while she plays with her cousins. Lucia joins her cousins to close the services each Sunday by singing the closing song, “God is So Good” in three languages. They get to sing it in Samoan, English, and Spanish to an appreciative audience each Sunday. This is such a positive experience for Lucia and her young singing group. They not only learn how to sing, but also how to overcome stage fright and how to become good leaders. While Lucia was singing last Sunday, she could see me taking her picture. She immediately lowered her head and her voice faded into bashfulness, but she immediately raised her head and voice and finished that song with confidence. Her family and the church family are so proud of her. Crazy Rugby fans are about to come out in force in Las Vegas for the Sevens Rugby. It's almost that time again. It is an all day 3day event. It's like Super Bowl all over again except this is better. The significant of this event is diversity and every participants from different countries show who they are in the world of rugby. What? Yes! Rugby is coming up in January 24th 2014 in Las Vegas. I caught up with these Americans this year 2013 at the Rugby Seven. This was my very first time seeing this event. I was quite surprised because it was much more than I anticipated. Seeing everybody dressed in their own costumes to show their favorite team was quite remarkable. It must took a lot of preparations and effort to arrive at this point.This event is becoming more popular and people are looking forward to seeing it every year now. If you are planning to attend this event, dress warm and be safe. Don't drink and drive. Los Angeles, Riverside, San Bernardino people, pull over and sleep then continue driving. Don't try to force your energy to get home after partying and seeing your friends.